This recipe uses frozen corn kernels. You can of course use corn from grilled corn on the cob. Usually I don't have any leftover corn when I grill corn, and if I do grill it, I want to eat it right then and there, on the cob. Mexican crema is a lot like runny sour cream. I don't usually have it around, so I usually use diluted sour cream when a recipe like this one calls for crema. But if you have crema, use it! 1 Sear the corn, then mix with mayo: Heat oil on high heat in a large, cast iron pan. When the oil is almost smoking hot, add half of the frozen corn (not defrosted) to the pan. Spread it out in the pan and let sear. Stir occasionally, until most of the corn kernels have browned a little on at least one side. You'll know the corn is ready when some of the kernels start "popping". Remove the corn from the pan to a bowl, and repeat with the remaining frozen corn kernels. Mix the corn with the mayonnaise and set aside. 2 Toast tortilla chips: Preheat oven to 350°F. 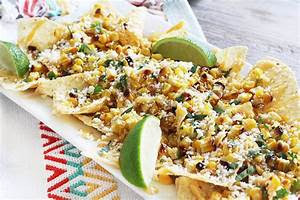 Spread the tortilla chips out on a large sheet pan and place in the oven for 10 minutes, until lightly browned. 3 Make cheese sauce: While the tortilla chips are toasting, make the cheese sauce. Set up a double boiler with an inch of water in the lower pan. If you don't have a double boiler, place an inch of water in a small saucepan and place a metal bowl over it so that steam from the boiling water below heats the bottom of the bowl. Do not let the bowl touch the water. Place the grated monterey jack cheese in the top pan or bowl of the double boiler. Mix with the cornstarch. Pour in the cream and milk (can use half and half if you want). Add the minced garlic. Heat the water in the double boiler to a boil. Let the cheese gently melt, stirring occasionally, until the sauce is smooth. 4 Assemble nachos: Once the tortilla chips are lightly browned, remove them from the oven. Transfer to a large serving platter. Pour the cheese sauce over the chips. Sprinkle the top with the toasted corn. Sprinkle with cotija cheese crumbles. Sprinkle with chipotle chili powder. Drizzle with the crema or diluted sour cream. Sprinkle with cilantro. Sprinkle with a little lime juice and serve immediately with lime wedges.